Louisiana Department of Health: Who gets Medicaid in Louisiana? The remaining 37 percent of enrollees are adults. While they account for only about 13 percent of state spending. The state funds percentage is low because most of this is funded by the enhanced federal matching rate for those who are eligible through Medicaid expansion. This graphic illustrates who gets Medicaid and how much is spent on each group. 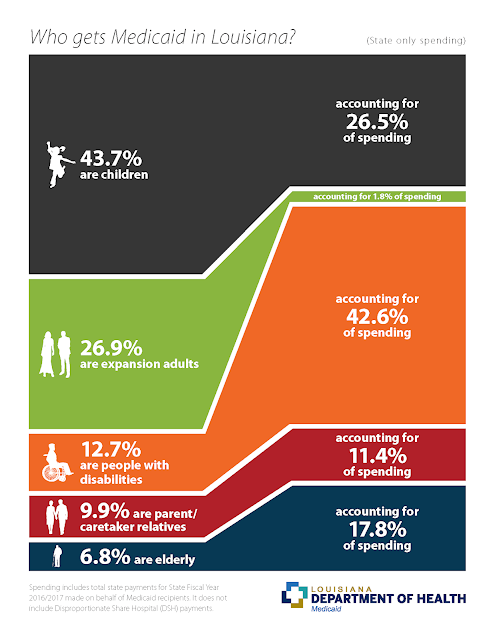 For a graphic that shows total Medicaid spending at both the state and federal level, click here.